And there are countless others. 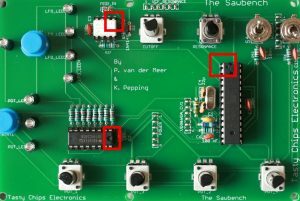 It’s probably best to study these before you continue..
As you may have noticed there are two PCB’s: Analog and Digital. The two are sandwiched on top of eachother (the digital on top of the analog). Analog takes care of power regulation and the signal path (VCO->VCF->VCA) and digital takes care of all controls. Finally there are off-board interfaces like DC power, MIDI, and audio out which will be panel-mounted into the back side of the casing. Putting it all together (also includes the assembly of the casing). We’ll cover digital (1) first, because it’s easy enough. Analog (2) involves the same techniques, but it’s more work. So this comes second. Finally (3) there’s how to make the sandwich and put it all into the casing. Just a quick but precise overview. For details on how the components look or what they do, see further on in this manual. Useful : photos of all components. Print these and overlay the components to check if they’re all there! 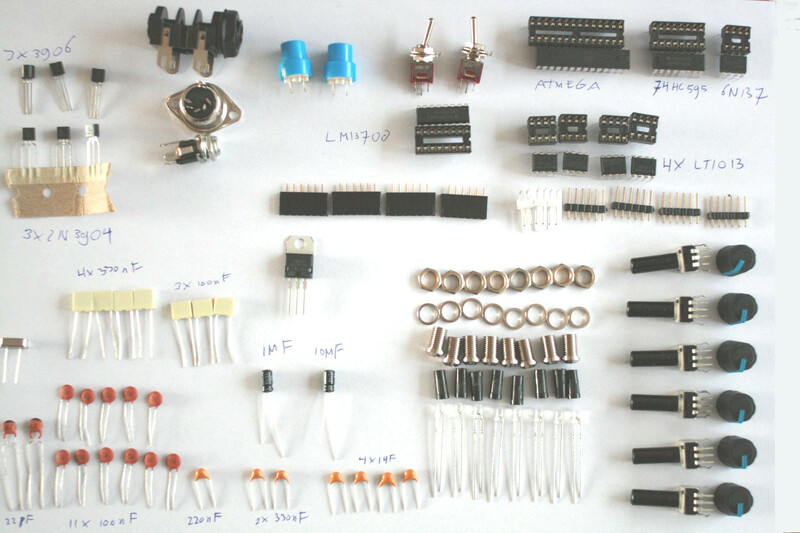 Photo of all kit components excluding diodes and resistors (Note: Led housings and plugs only in full kit). The digital board is the big board. It houses the microcontroller, all the leds, buttons, switches and potmeters. It also has 2 MIDI input pins for off-board connection. 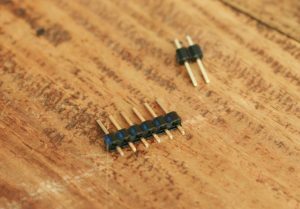 You’ll start with the lowest components: the 1N4148 diodes. These are little 3mm long glass thingies, the smallest components in the kit. There is only 1 of these on the digital board. ATTENTION: diodes are POLARIZED! They will only work if you place them in the right direction. Reversing them will result in a non-working PCB. 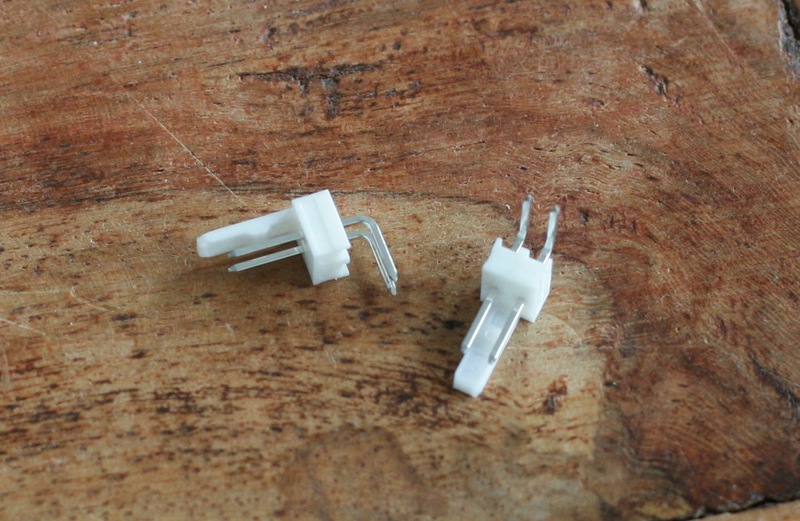 Fold the legs of the diode as closely to the glass as possible, until you have an ‘n’ shape. Insert the two legs through the holes. Note the direction! 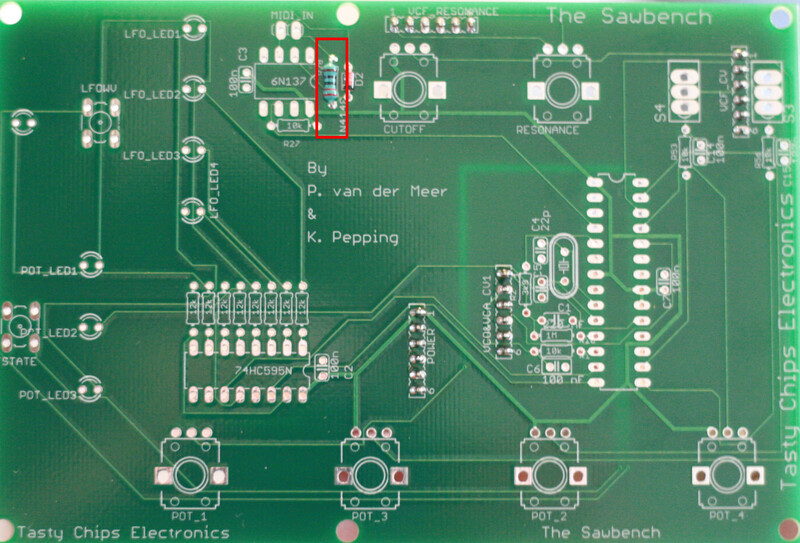 The stripe on the PCB silk screen should align with the stripe on the component! 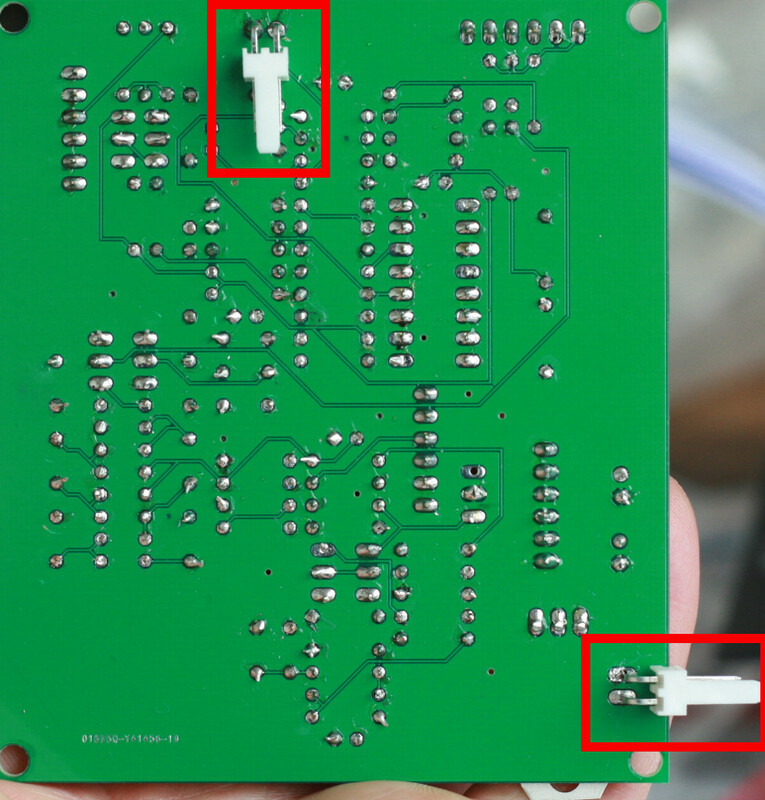 If you fail to do this correctly, the PCB won’t work. Push the component all the way down. Fold the legs on the bottom side of the PCB. Solder the points where the legs enter the PCB holes. Cut away the legs. 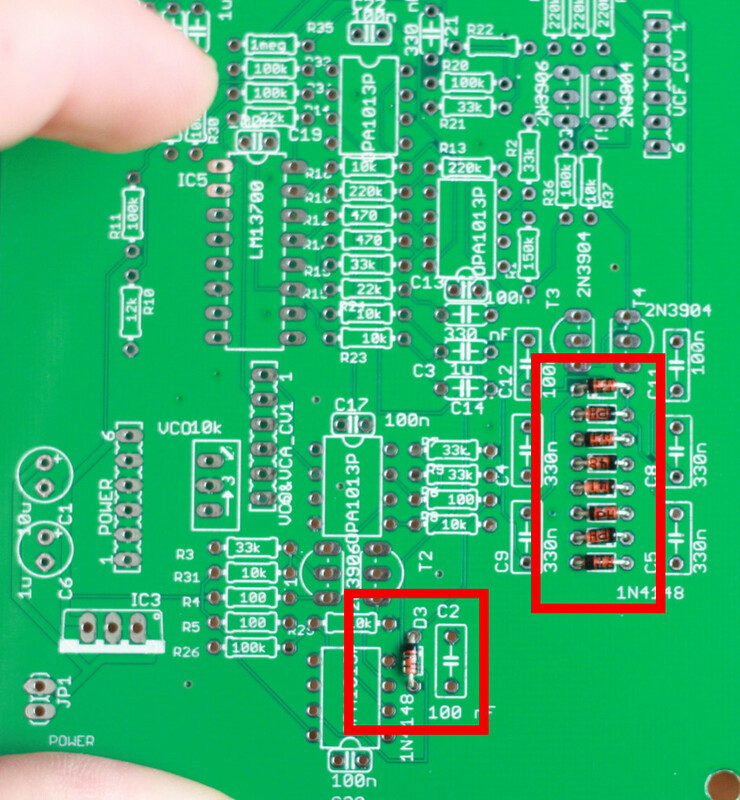 Do this close the PCB, but don’t overdo it, you may snap away the tin. 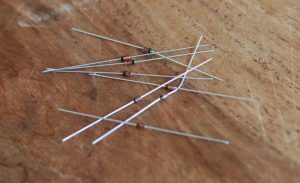 Diode folded to ‘n’ shape. 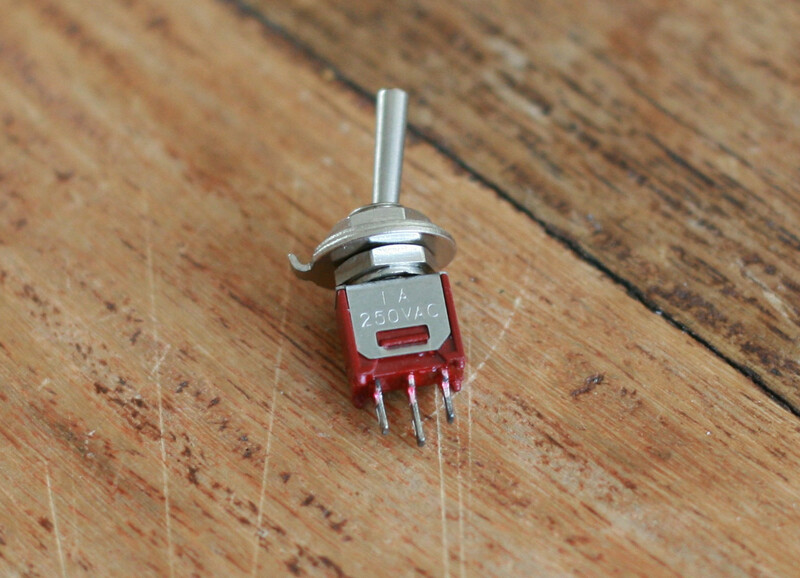 Diode inserted into its destination. The bar on the silk screen and on the diode align. The inserted diode seen from the bottom of the PCB. The legs are bent so that it remains in place. 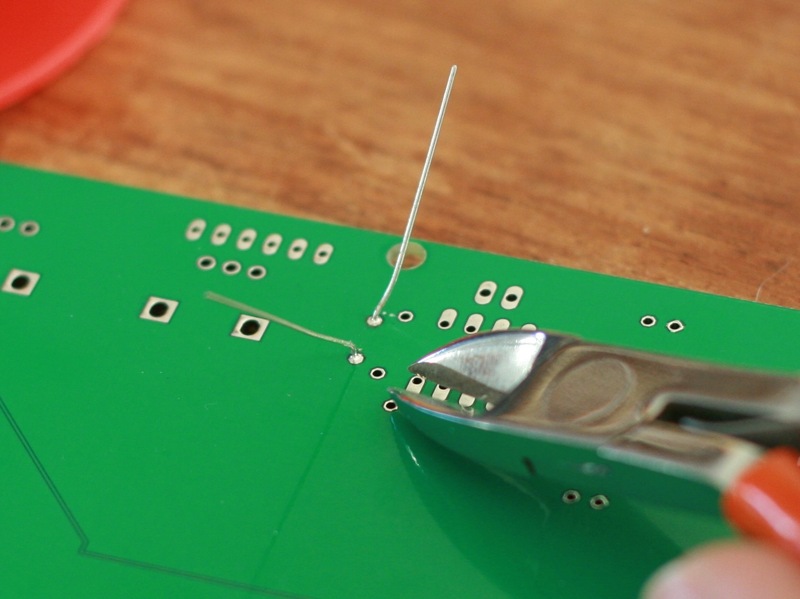 The soldered diode getting its legs cut. These are 4 6-pin and 1 2-pin male headers (in newer kits this is a white 90 degrees version, not a straight one!). Male headers, 2 pin and 6 pin. 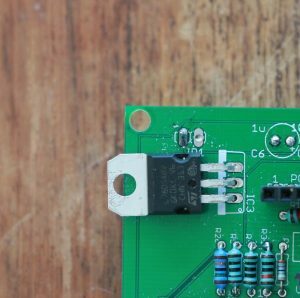 The male headers can just be pushed into the PCB holes and when you lay down the PCB with the header inserted it will stay there. The longest side should stick out of the bottom side. The plastic should also be on the bottom. 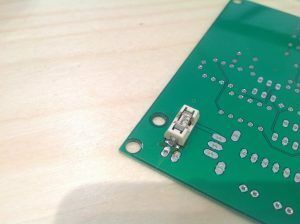 So, soldering should be done on top top side. 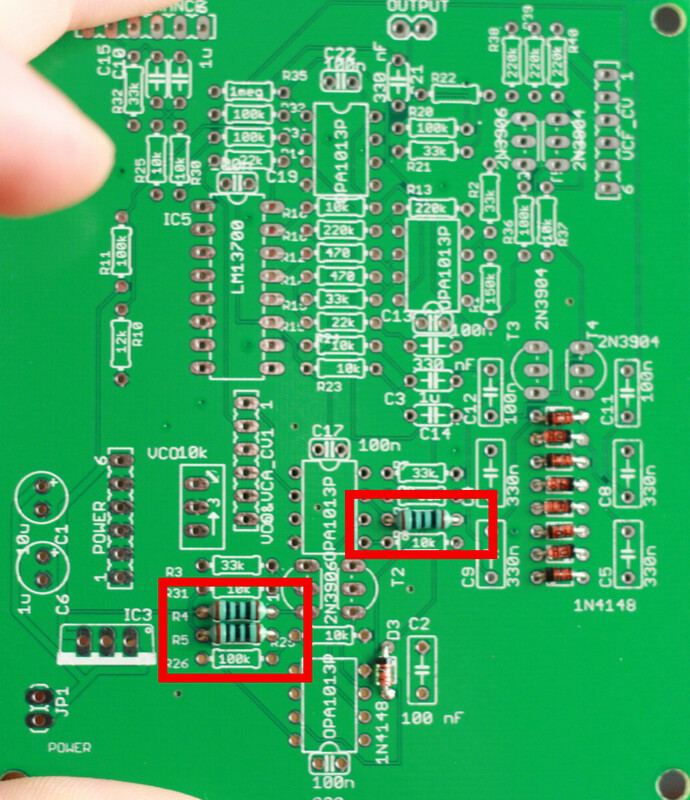 Since the header is stuck in the PCB, just proceed and solder all the pins in a row. You’re done with the headers. Solder the male header on the top side of the board. Next step is the resistors. 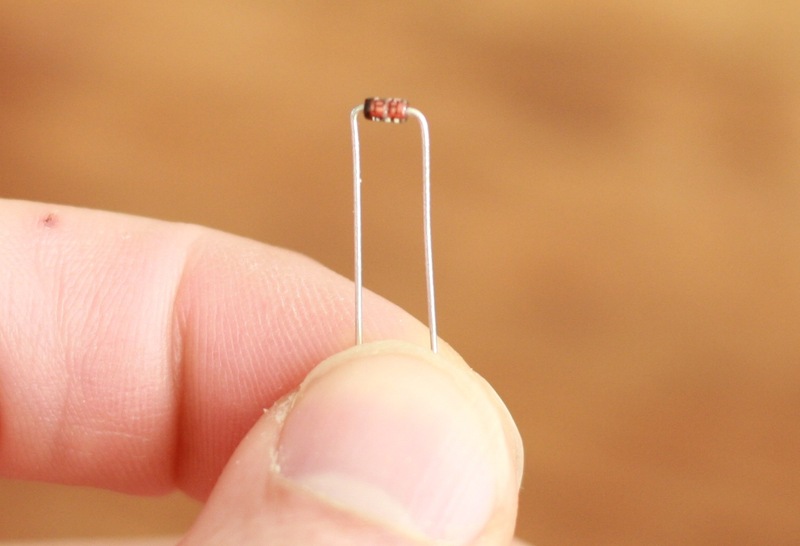 The resistors are about 6 mm long and somewhat higher than a diode. 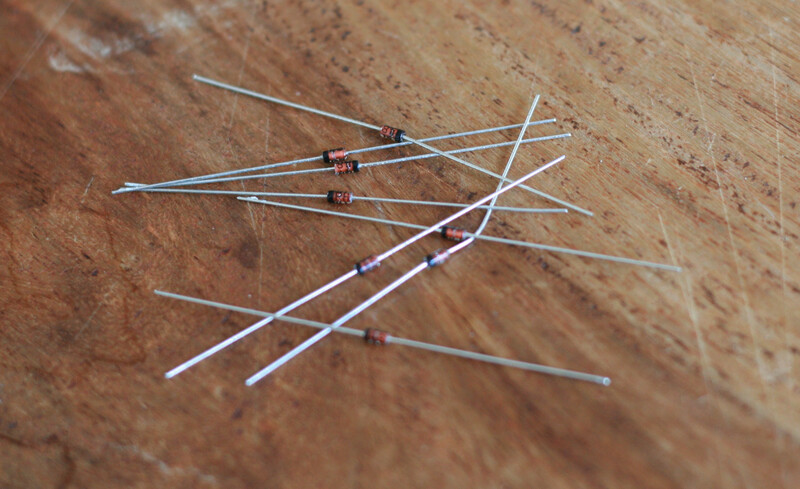 Resistors are not polarized, so you don’t need to worry about the direction. Resistors are color coded. This means you can read their value by interpreting the coloured bands printed on them. 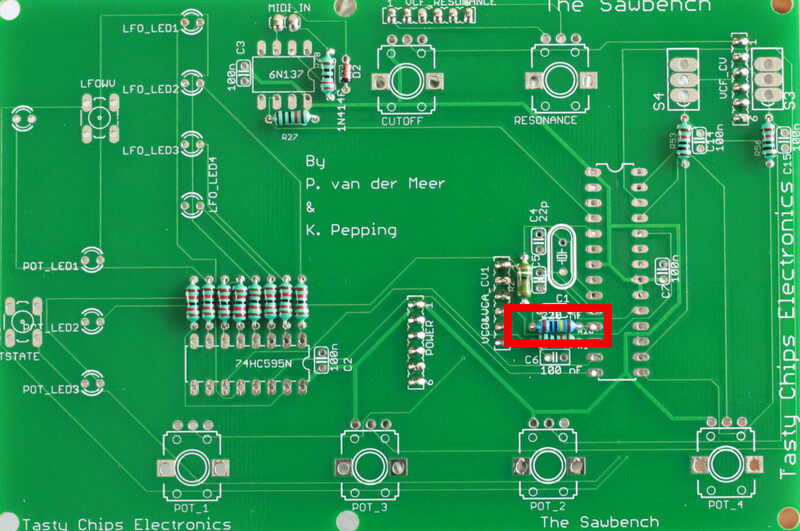 Note that you can also measure the resistor value with a multimeter, which is essential to the color blind, but also useful for people with normal eye sight. Forget the brown one on the top. That’s too inaccurate for us. Look at the blue one, with 5 bands. These puppies are 1% tolerance. 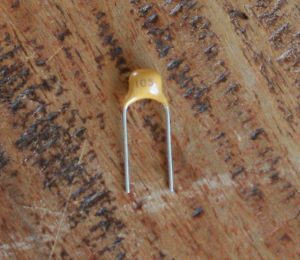 Which means at most a 100 ohm resistor could be between 99 and 101 ohm. Good enough. You can see that these are grouped and sorted by value. Solder each group like specified in the 6-step plan above. Look at the pictures below for the positions. 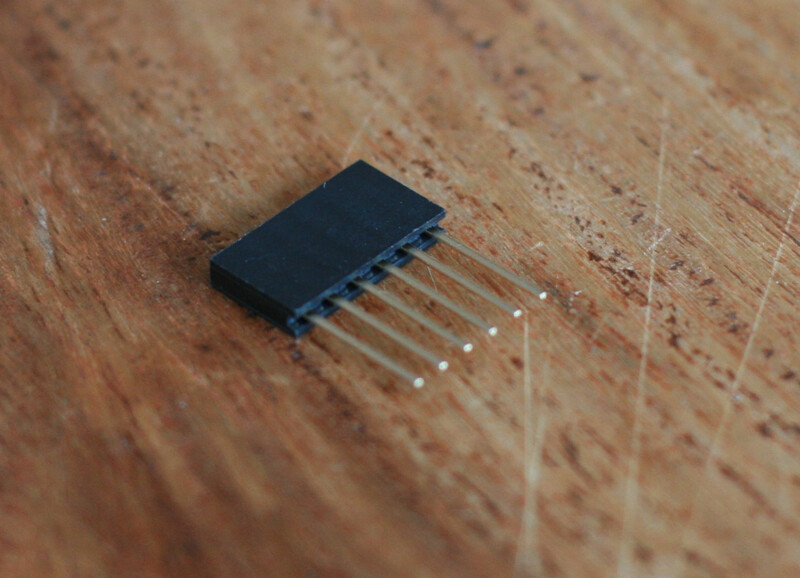 The crystal is found left of the Atmega. Solder it just like any 2 leg component. Use the 6-step plan. Place the socket over the pins where it belongs. For instance, IC1 has a DIP8. The direction is important here. Position the socket over the silkscreen drawing with the little gap aligned. Push down the socket. Or in most cases, just let it slide in. Gravity will do the rest. 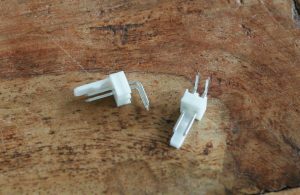 Bend the outer most socket pins to secure the socket.. For instance, the upper-left pin and the lower-right pin. Solder all pins on the bottom of the PCB. Step 1: Align the socket with the silkscreen so that the gaps overlap. Step 3: Outer most pins of the socket are bent so that it stays put. The best way to proceed is to first do steps 1 through 3 for all sockets and then collectively do 4. This speeds things up. 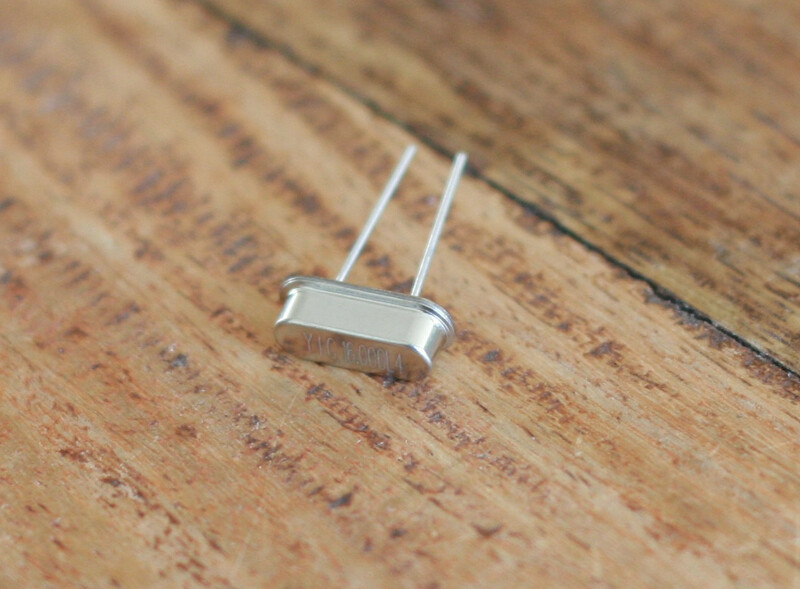 These are the capacitors that have a relatively low form factor: just slightly higher than sockets. 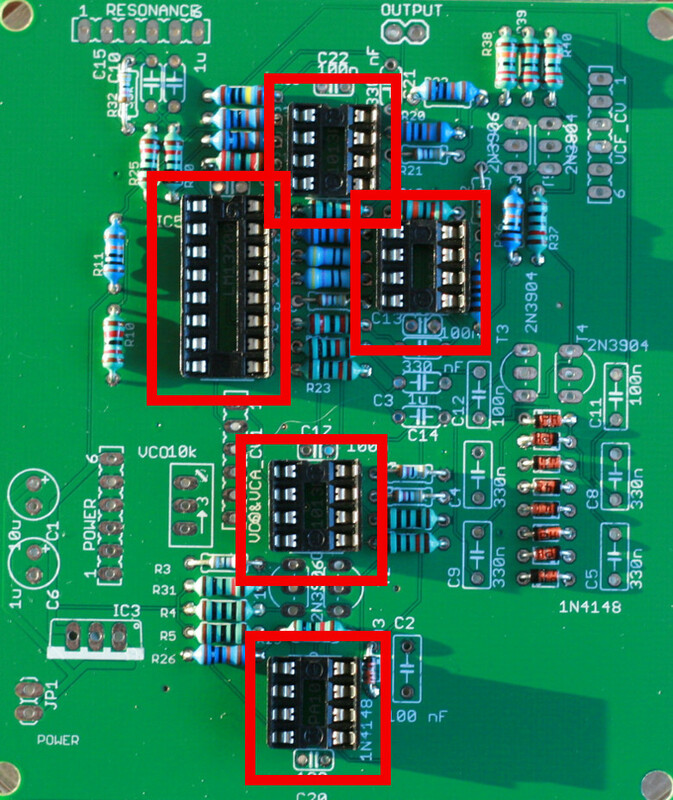 The high capacitors (the black cylinders) are special ones, called electrolytic capacitors (or elco’s). These will come later on. Let’s start with the ceramic disk 100n ones. These have “104” written on them. 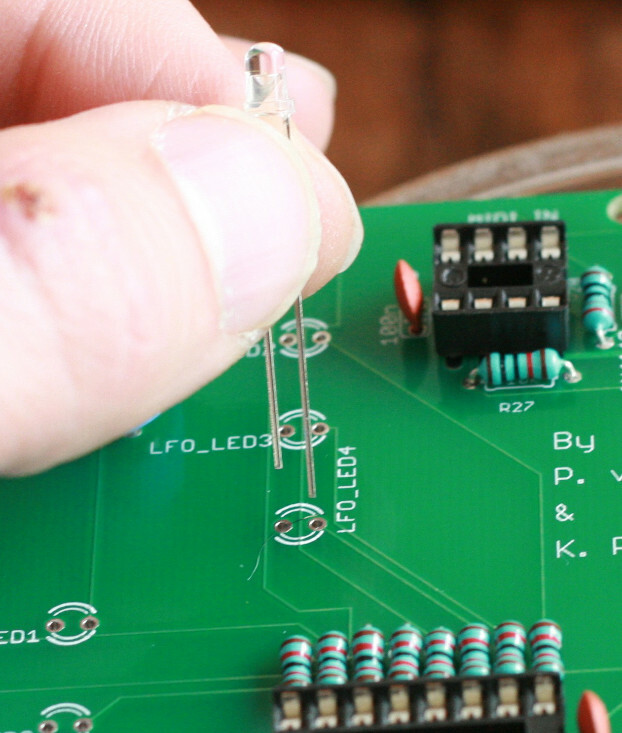 You can use the 6-step plan, the same as for resistors. Next up are the 220n droplet (labeled “224”) and 22p (labeled “22”) ceramic capacitors. Once again use the 6-step plan. Push button in place. Take care the the white part points in the right direction. If the button has the wrong orientation (90 or -90 degrees rotated) then it won’t work! Be careful! The buttons are labeled “S1” and “S2” and should be easy enough to find on the PCB. These are symmetric and can be placed any way you want. 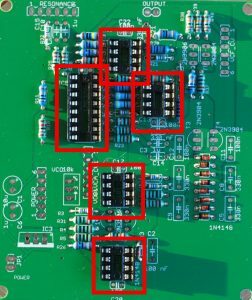 They are labeled S3 and S4 and are easy to find on the PCB. Some things to keep in mind: you mind want to fasten them while soldering (duct tape? ;)). More importantly: The pads are pretty big and invite you to smack a big lump of solder on them. Unfortunately they’re also very close to eachother, so watch out! Don’t use too much tin! First of all: the LEDs are part of the electronics kit, the spacers are part of casing. 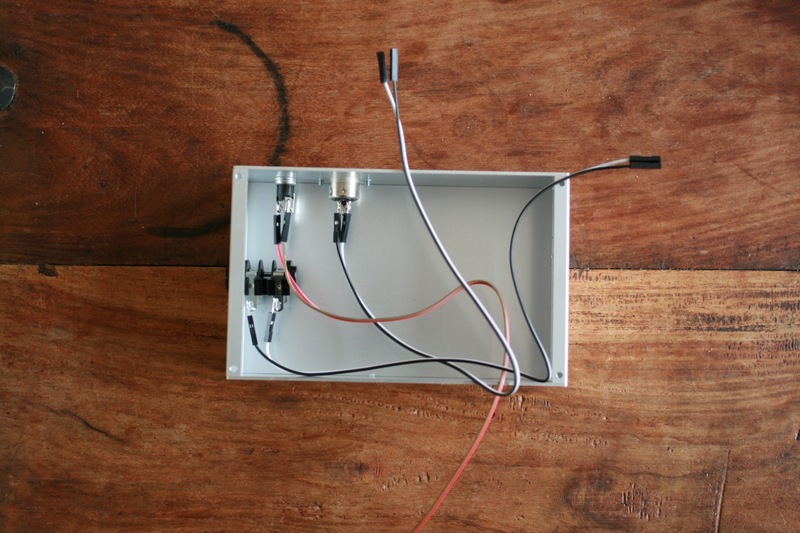 We expect bare bones DIY’ers to fix up their own casing and possibly their own LED housings. What is explained here is intended for usage with the full kit, including the casing! In any case, this is the trickiest part of the digital board! LEDs are polarized. The long leg is + and the short one is -. The long one should go into the hole with the trace. See the pictures. Also, the spacer should have its thin side up, wide side down. 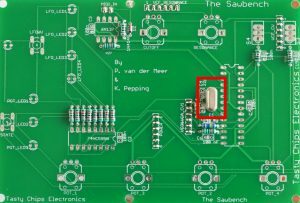 LED orientation: long pin (+) goes into the hole with the PCB trace! 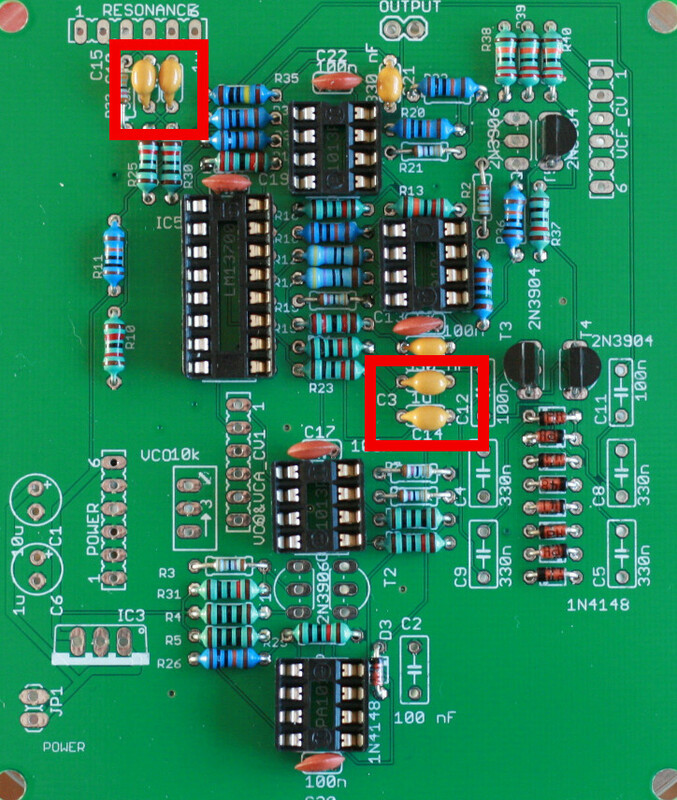 When placed on the PCB, even when you cannot see the leads you can still make out the orientation by looking inside the LED. Spacer with LED insterted. Note the gap inside the LED points right when + leg is right. Spacer with LED inserted. NOTE that the thin side is up, wide side is down!! Otherwise it won’t fit in the front plate’s LED housing! 7 out of 8 leds are oriented with the + leg to the right. only the LFO led (the isolated one most to the left) is the other way around. Once again, this is important!! Digital board with all the LEDs on it. The potentiometers are almost trivial: there’s only one type and there’s only one way to fit them. Just push them in. 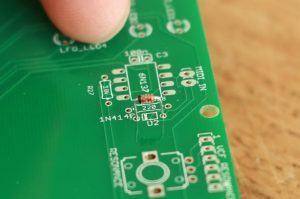 You should feel them “snap” into the PCB. They are now already stuck in place. When all 6 are inside, just flip over the board and solder them. Digital board with all IC’s installed. Mind the side of the gaps and dots. The analog board is the small board. It houses all the analog units: VCO, VCA, VCF and power regulation. 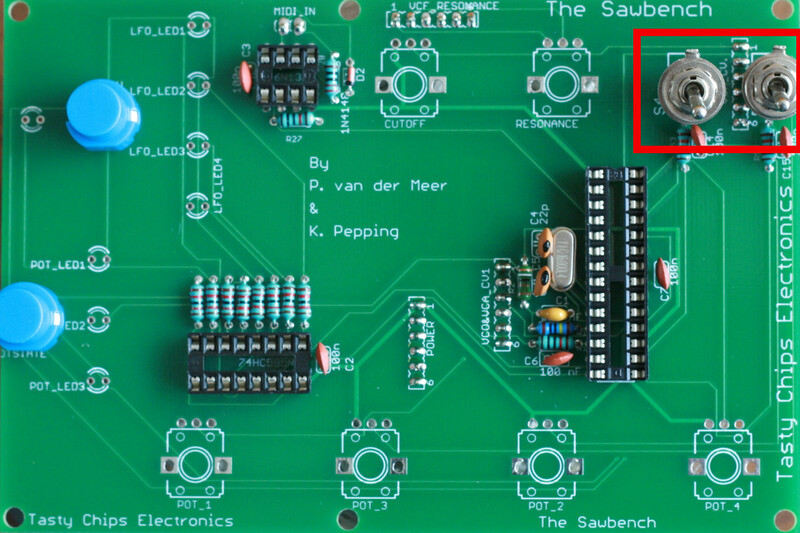 The analog is sandwiched underneath the digital board from which it receives control voltages. Sandwiching is done with 6 pin headers. Off-board connections are two 2-pin male headers: power and audio out. 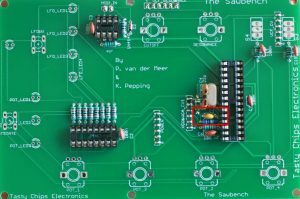 There are two revisions of the analog PCB, 0 and A. Rev A is the current revision being shipped as of October 2016. 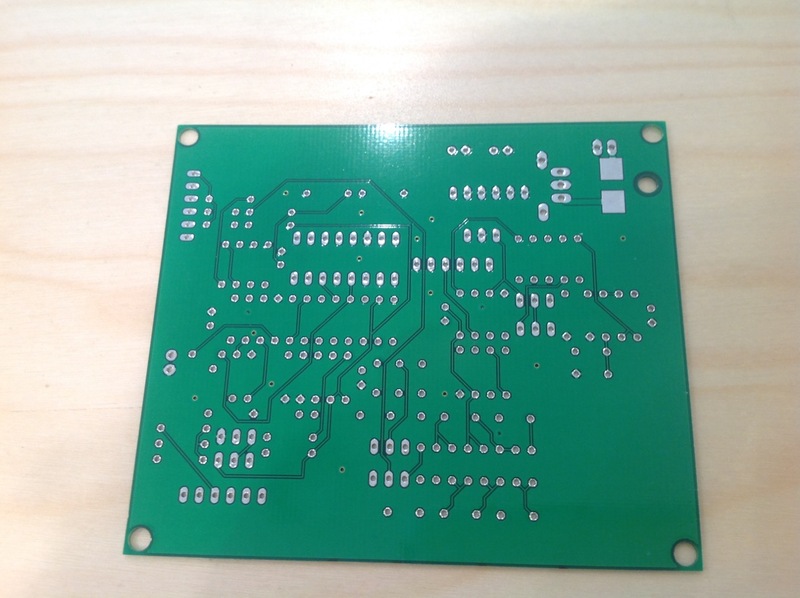 It is marked on the silkscreen of the PCB’s. There is no difference in performance. The only difference is that we added a protection diode and fuse. This will protect the circuitry from accidentally reversing the polarity! 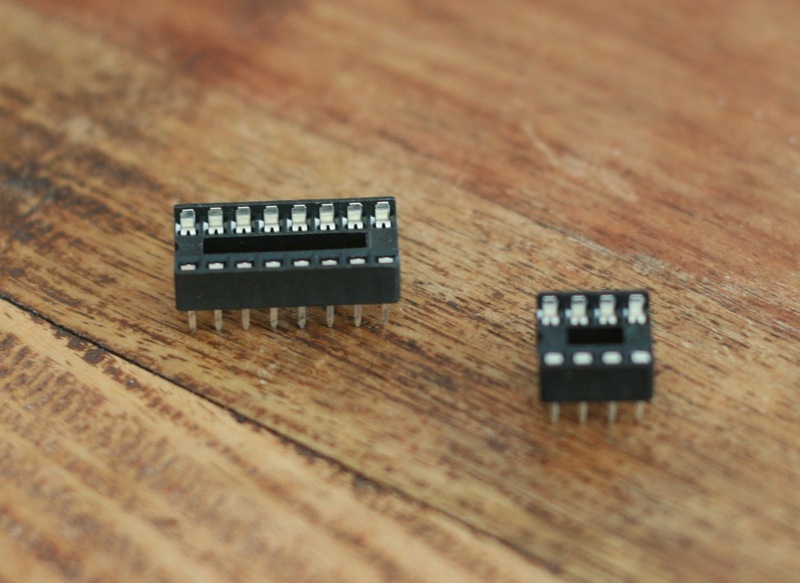 You’ll start with the lowest components: the 1N4148 diodes. 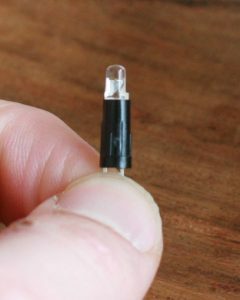 These are little 3mm long glass thingies, the smallest components in the kit. There are 9 of these on the analog board. 8 of them are in the VCF, in one large column. The remaining one is in the VCO. 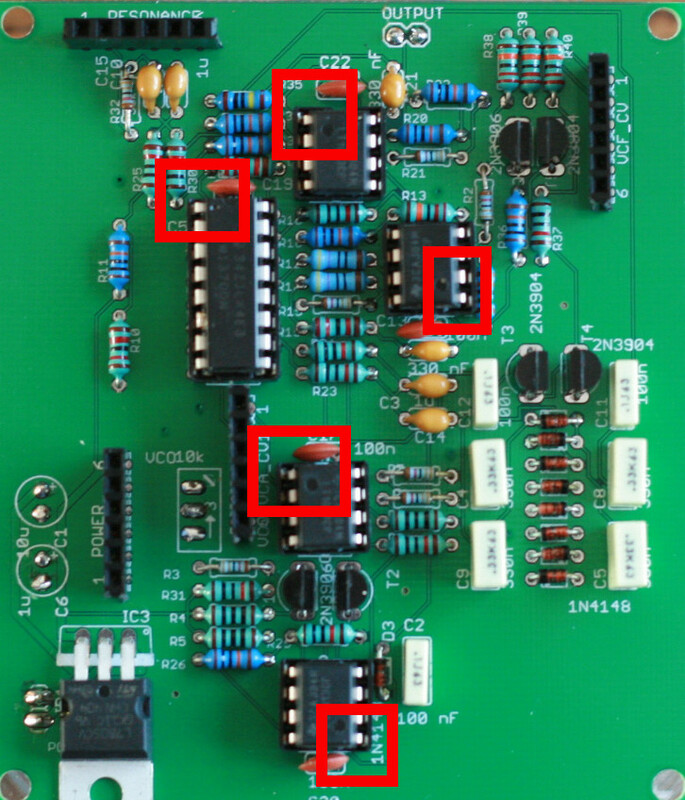 It’s probably best to perform steps 1 to 5 for all the diodes and only then proceed to 6. It saves time. 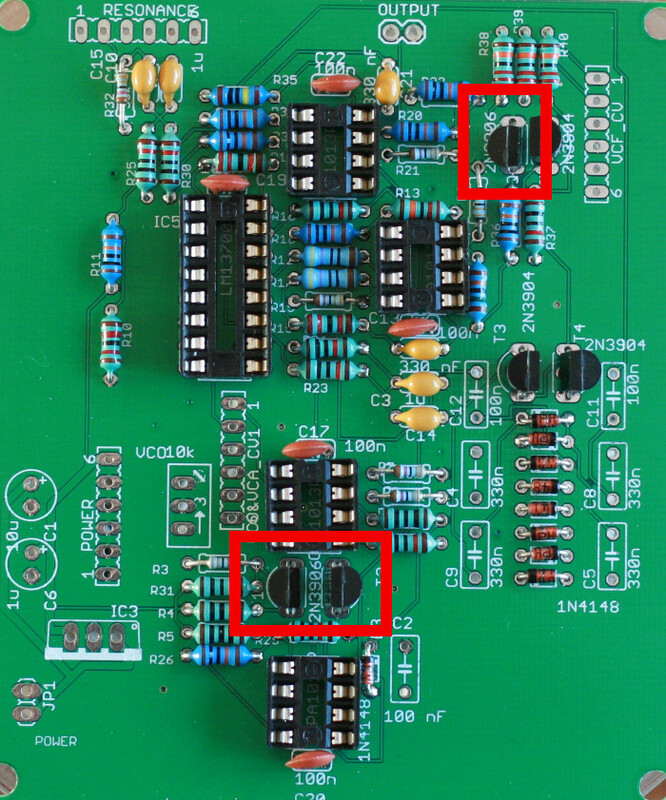 Positions of the diodes on the analog PCB. Positions of the 100 ohm resistors on the analog PCB. 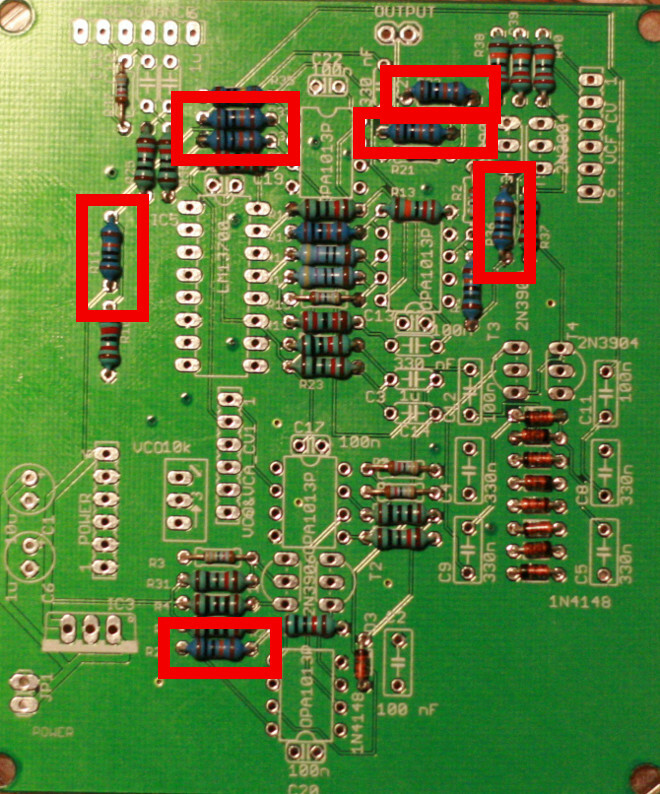 Positions of the 470 ohm resistors on the analog PCB. Positions of the 10k resistors on the analog PCB. Position of the 12k resistor on the analog PCB. 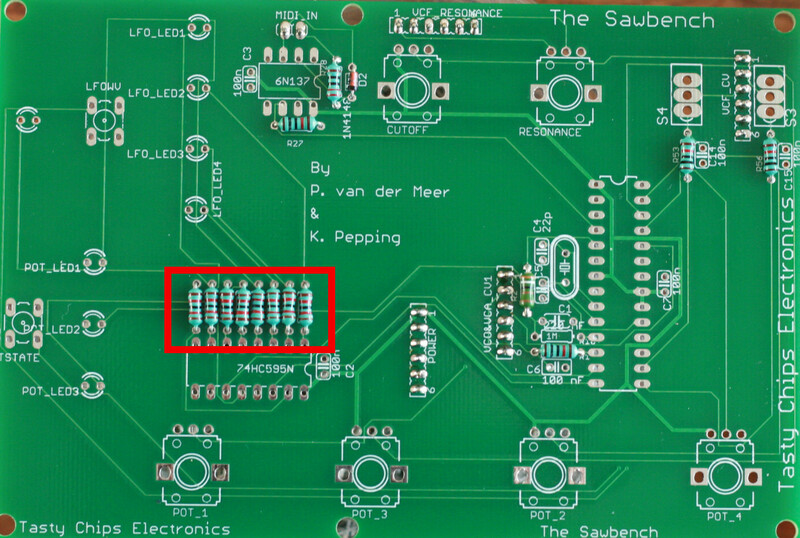 Positions of the 22k resistors on the analog PCB. Positions of the 33k resistors on the analog PCB. Positions of the 100k resistors on the analog PCB. Position of the 150k resistor on the analog PCB. Positions of the 220k resistors on the analog PCB. 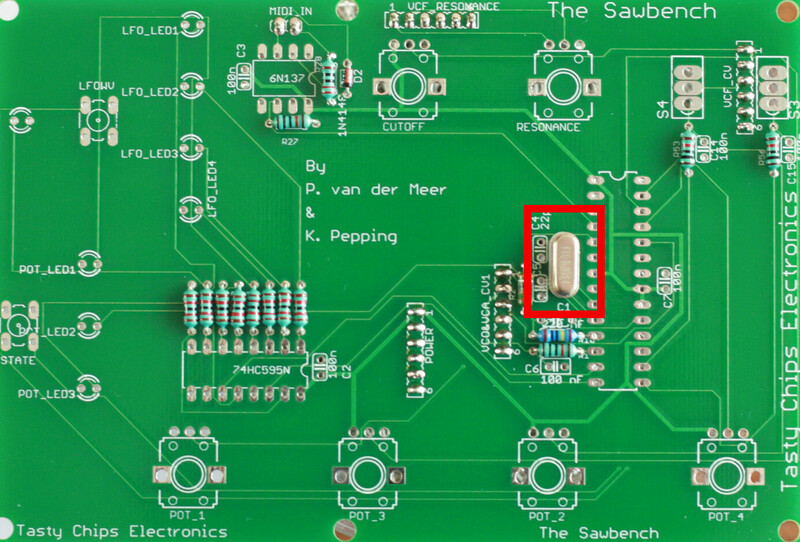 Position of the 1M resistors on the analog PCB. 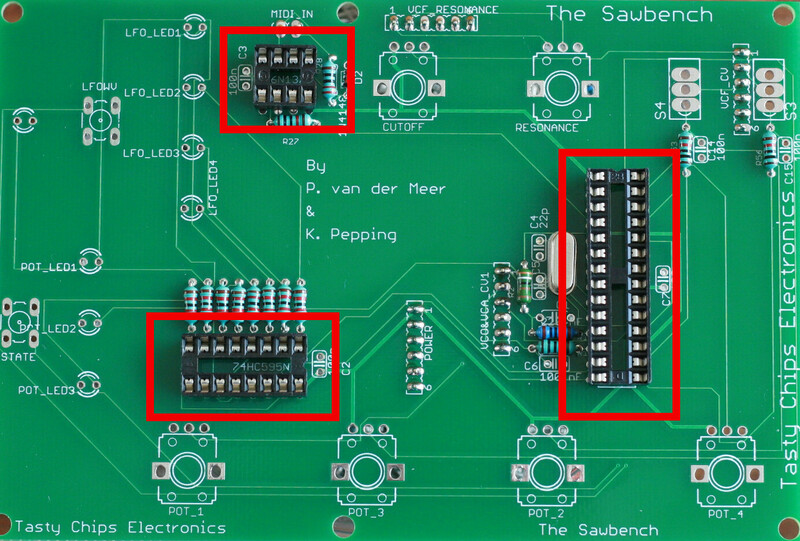 Positions of the IC sockets on the analog PCB. Let’s start with the ceramic disk 100n ones, marked “104”. 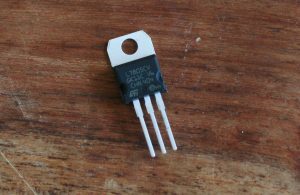 These are used to avoid noise and spikes on the IC’s. 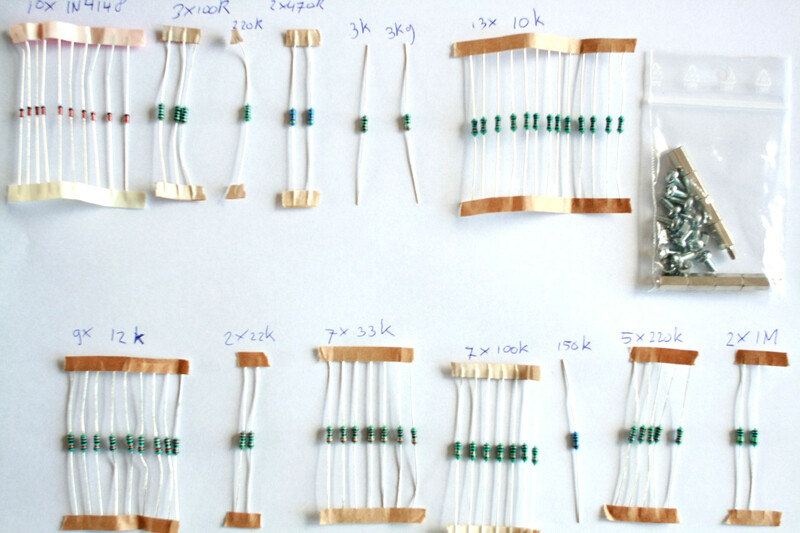 TODO: component picture You can use the 6-step plan, the same as for resistors. Next up are the 330n droplet and 1u ceramic capacitors. TODO: component piccy. Once again use the 6-step plan. The value is written on them: “105” means 1uF, “334” means 330 nF. 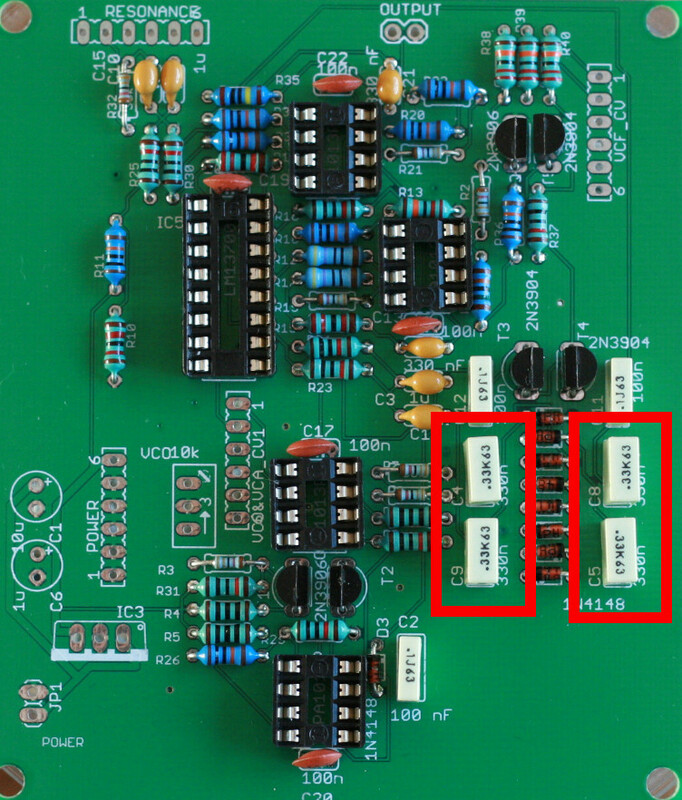 Positions of the 100 nF ceramic bypass caps on the analog PCB. 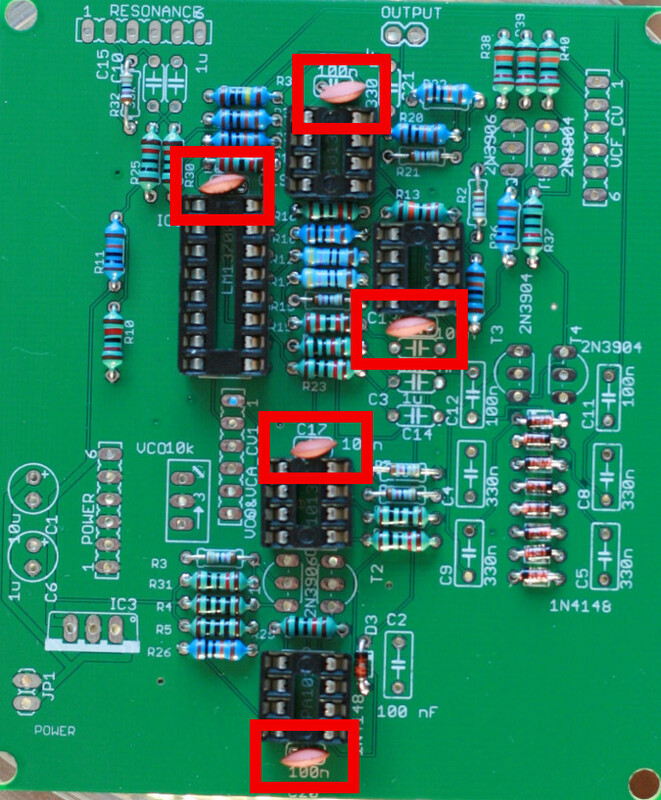 Positions of the 1 uF ceramic caps on the analog PCB. These are three-legged black thingies. We’re using the types “3904” and “3906” here, which is also written on them. But the writing is pretty small and since three digits are the same it sometimes requires you squinting your eyes, or installing better lighting to distinguish between the two. This is essential, the circuit will not work when the two types are swapped. Also keep in mind that the transistors should be aligned like on the silkscreen. The round and flat sides should align. 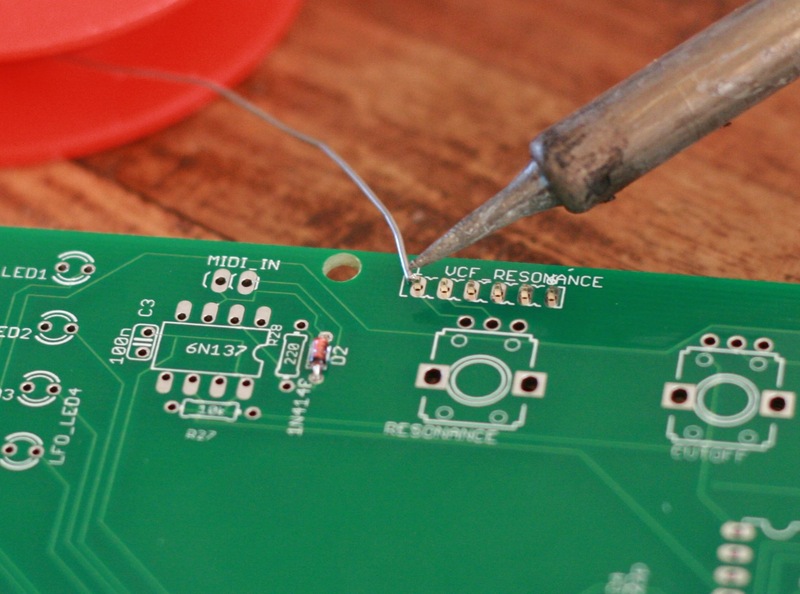 It’s probably best to first solder one kind and then solder the other. 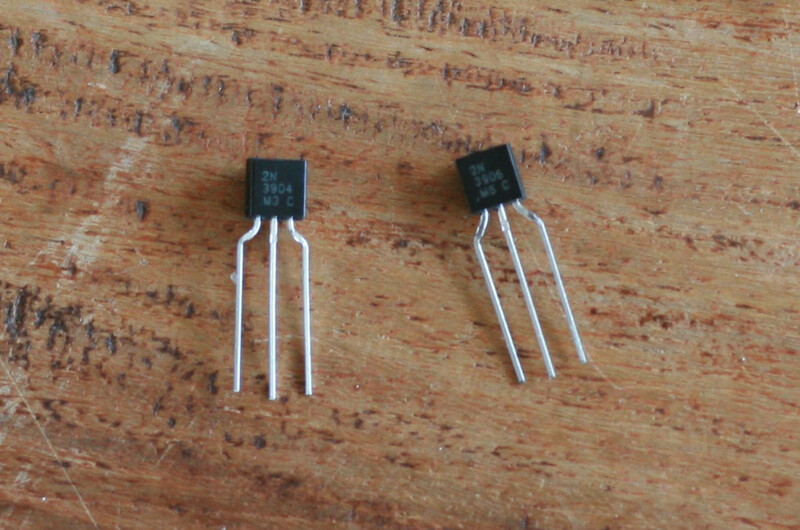 The 3904 is used in the VCF 3 times, and the 3 3906 is used in the VCO twice and once in the VCF. 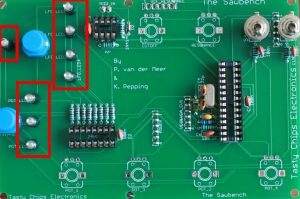 Position of the 2n3904 transistors on the analog PCB. 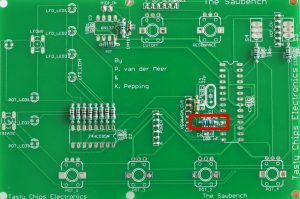 Position of the 2n3906 transistors on the analog PCB. Now the polyester film caps. Polyester film (“box”) capacitors. Disclaimer: the left boxcap being red and not creme white like in the kit may damage your bicycle. 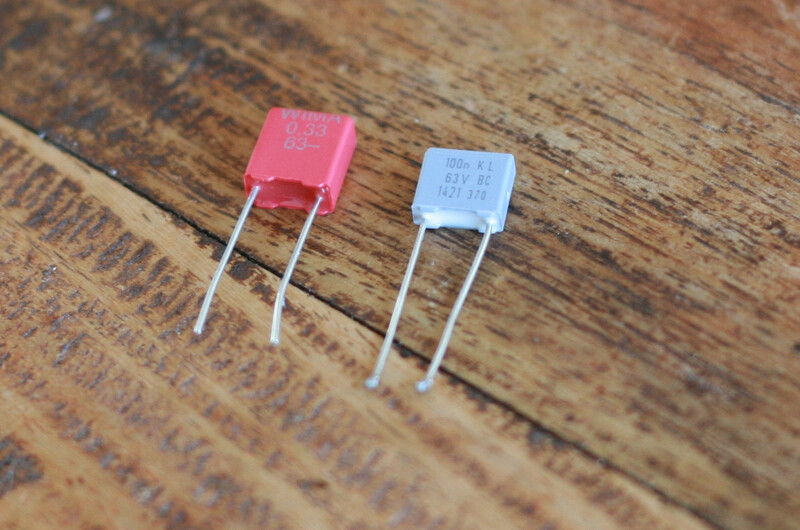 These are capacitors that are not easily influenced by temperature and hence are ideal for VCO and VCF. They are shaped like a flat box. 4x 330n and 2x 100n go into the VCF. They are present in two columns. 1x 100n goes into the VCO. 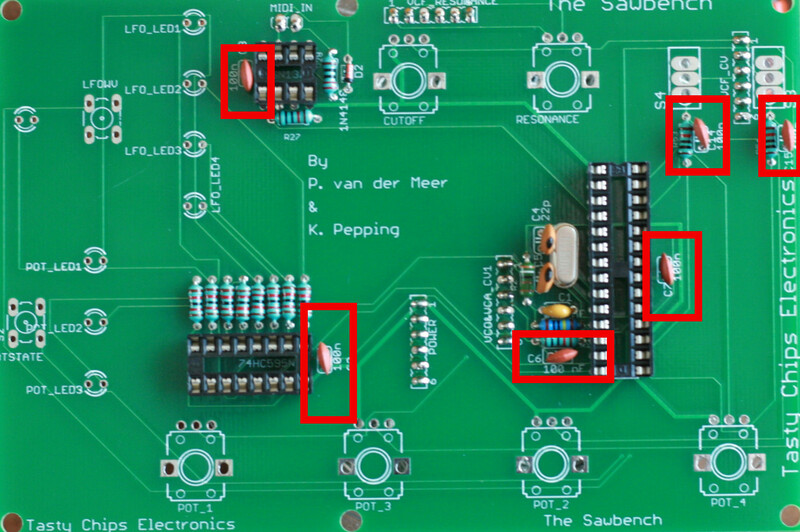 Positions of the 100n boxcaps on the analog PCB. Positions of the 330n box caps on the analog PCB. The trim potentiometer was used in the prototype design, it may still be useful for when modding the saw bench, but the newer firmwares do not need it. 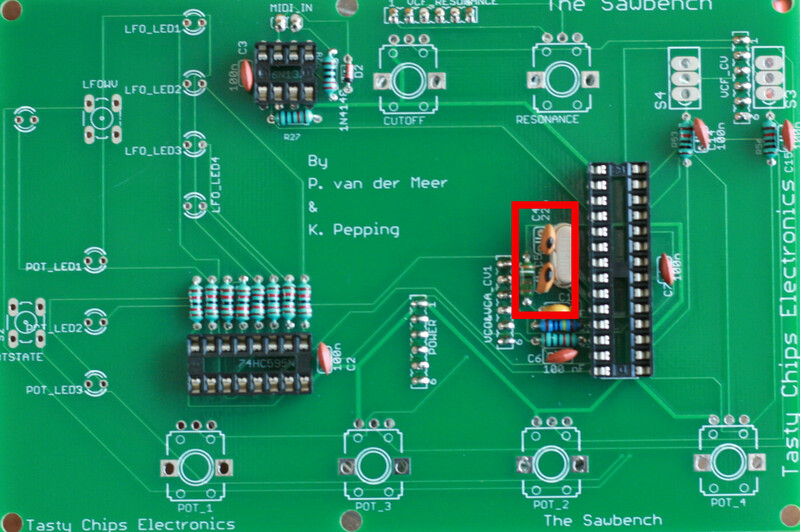 A 3k (or 2k7 or 3k3) resistor can be placed between terminals 1 and 2 instead (check the silkscreen: these are terminals furthest away from the drawing of the screw). 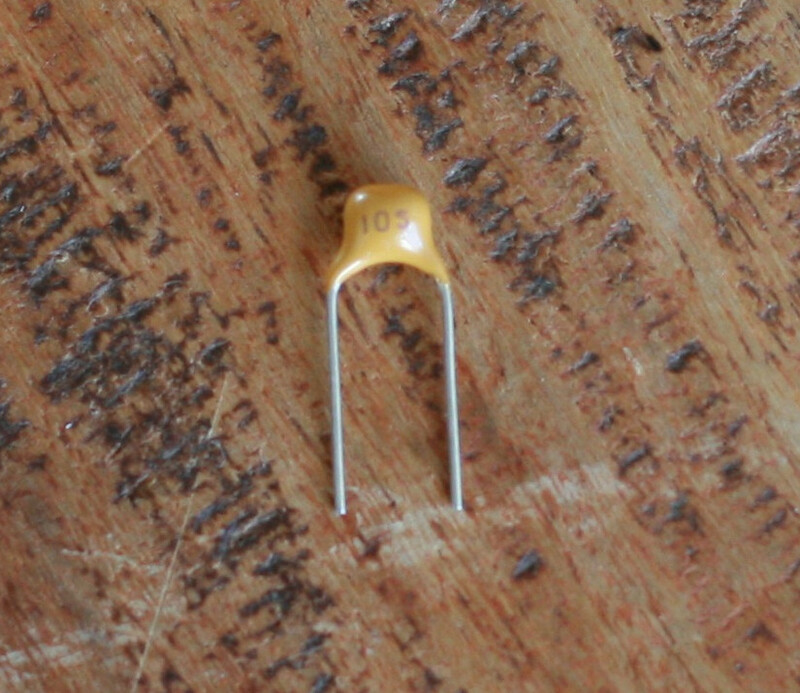 A 2k7 resistor between terminals 1,2 of the trimmer. There are only two of these and they are part of power regulation. Note that these are POLARIZED! Reversing the leads will result in the destruction of the elco! The elco’s top will start to bulge, which is an indication that it is ruined! The negative lead is shorter than the positive lead and also the negative side is indicated on the cylinder by a white stripe. The elco’s supplied in the kit are special low-profile ones. There are many types which do not fit in the sandwich!! The DIY buyer beware! 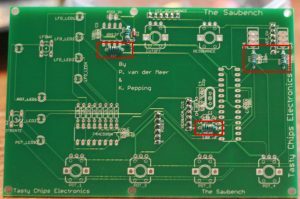 The low-profile elco’s soldered onto the analog board. Please note the white stripe indicating the negative leg. 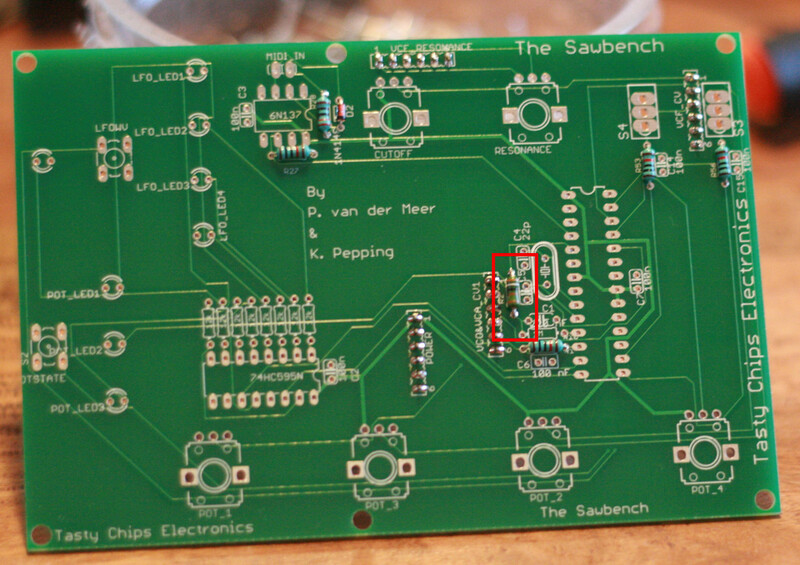 Only the 7805 needs soldering here, the other IC’s just go into their sockets. 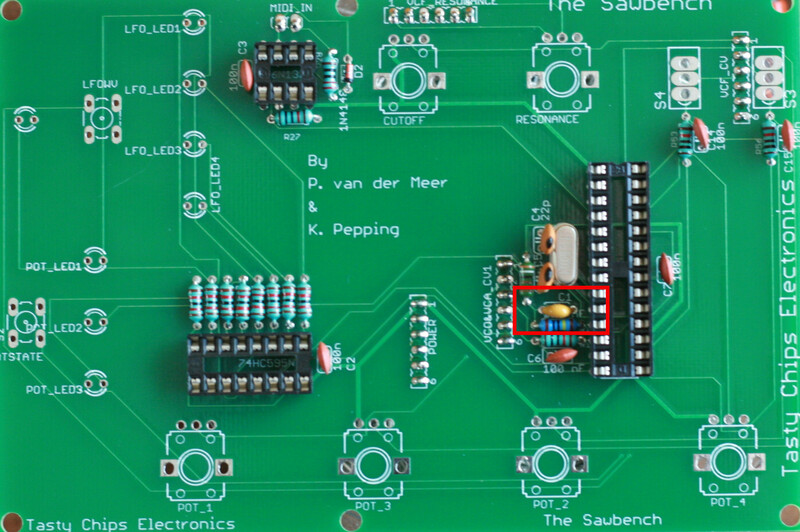 The 7805 is located on the lower left side of the PCB. This regulates the incoming DC voltage (9V .. 12V) back down to a stable 5V. It’s the big 3 legged thing. This thing is polarized, but the silkscreen is very clear about what back and front should be. This component can be soldered on top. 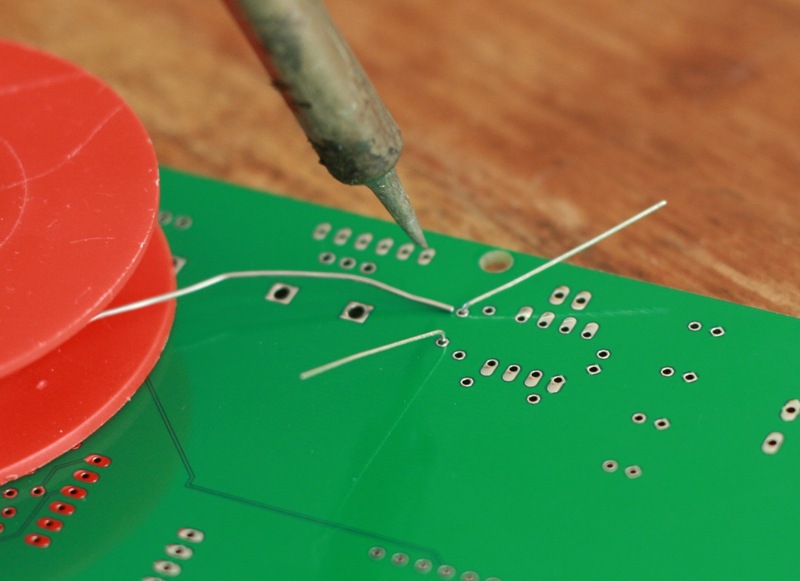 When you’re done, cut the excess leads and bend the 7805 back towards the edge of the board. 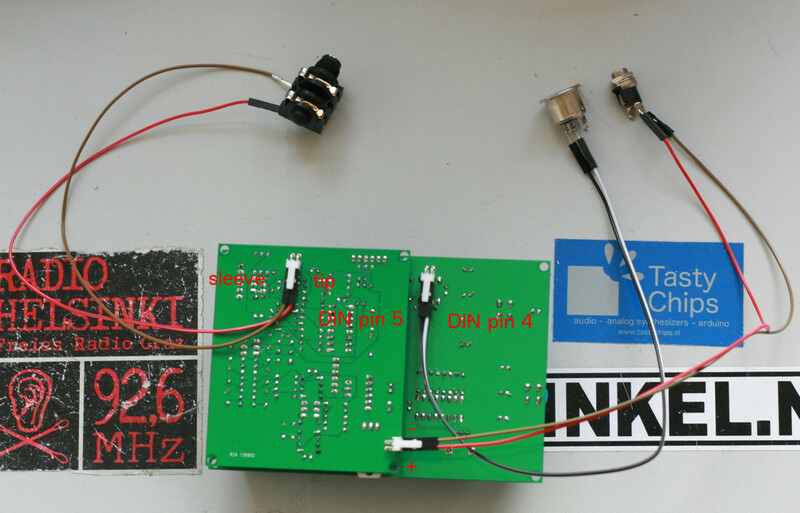 Push IC’s IC1, IC2, IC4, IC5 and ICVCF into their respective IC sockets. Take care of the orientation. For the LM13700: the little gap on the silkscreen should match the one on the IC. 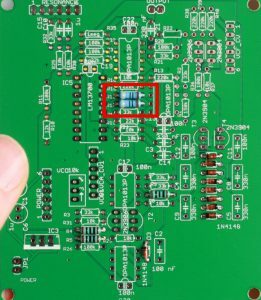 For the LT1013’s: the dot on the IC should be on the side of the silkscreen gap. Once again, orientation is important here. Reverse it and the IC’s may get fried!! Beside the fuse we added a 1n4004 protection diode. It goes on the component side of the PCB. This is a POLARIZED component so watch for the marking on the silkscreen. When the polarity is accidentally reversed the current will flow through the diode breaking the fuse. There are 4 6-pin stackable headers. 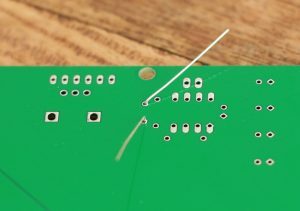 Just place one through the holes, don’t bend the pins, keep it pushed down, and solder the first pin. 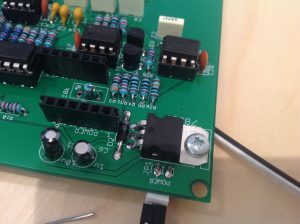 You can also turn the board upside-down with the header in place. Then you’ll have both hands free. 😉 Solder the pins. Repeat for the other 3. 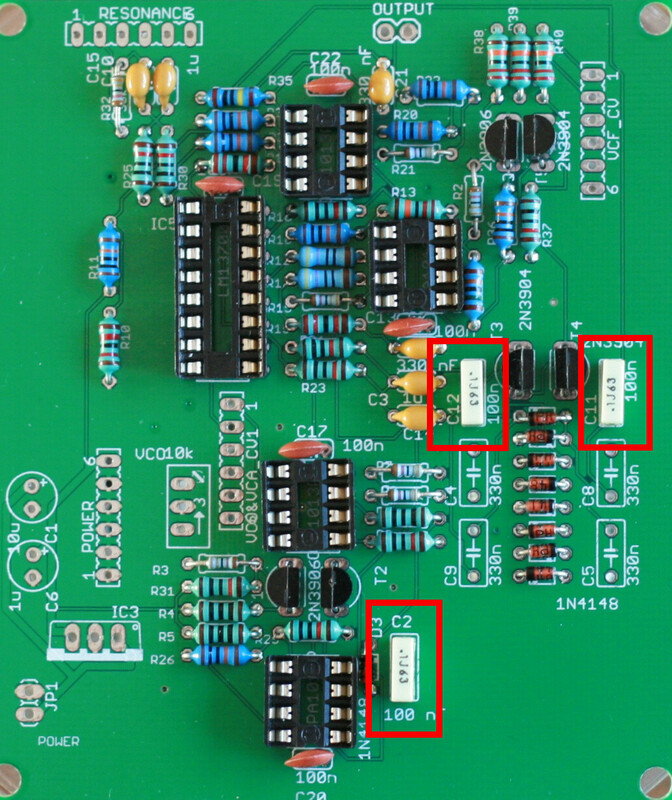 There are two 2-pin male headers for power in (labeled “JP1” / “POWER”) and audio out (labeled “OUTPUT”). Push in the 90 degree male headers. The longest side should stick out of the bottom side. You can use tape to keep em there. Or you can use your hands if you’re just a bit more handy. 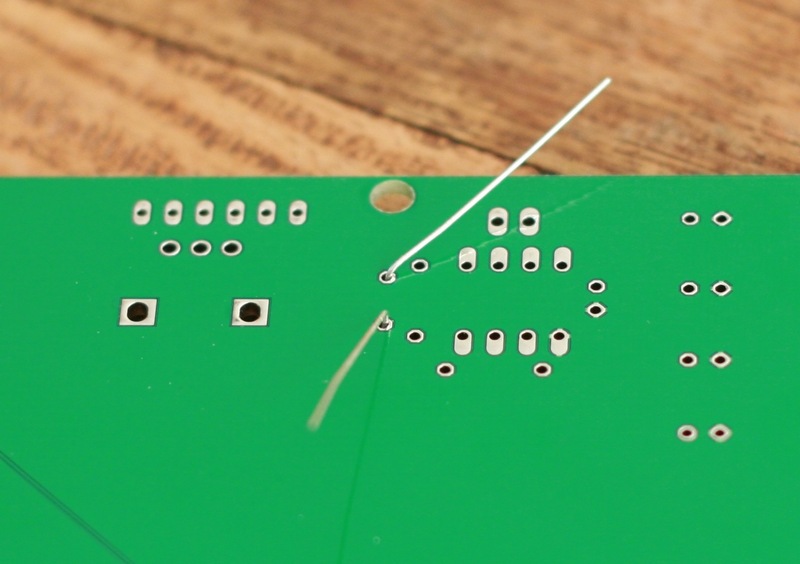 Then just solder all the pins and you’re done. 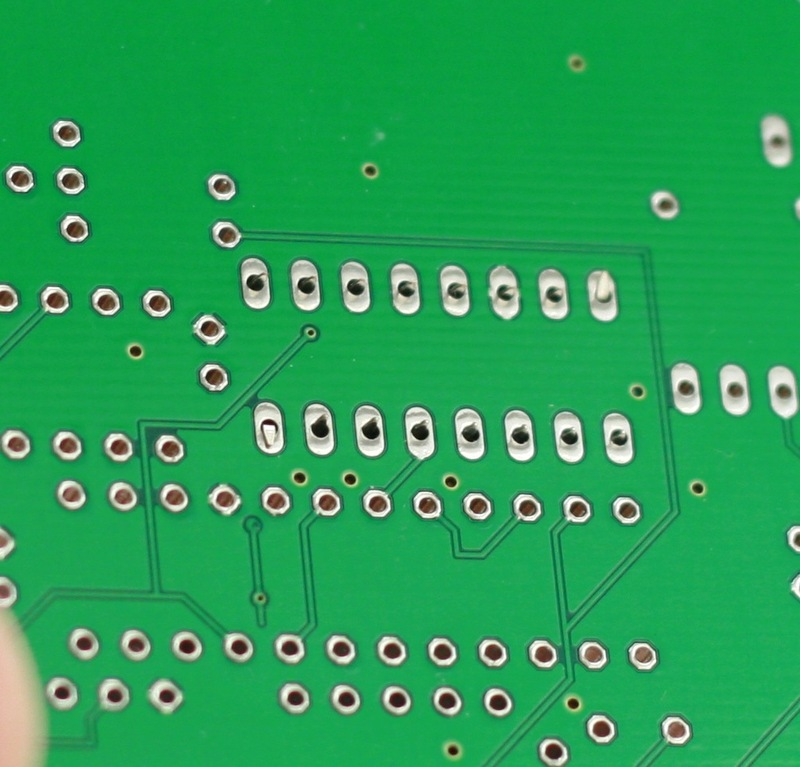 Assembled analog PCB with IC’s, mind the orientation of the dots. You’re done with the analog board! Loads of different types of components, but it all ended well, didn’t it? Bottom side of the finished analog board. Note the special 90 degree pin headers for power (side one) and output (top one). 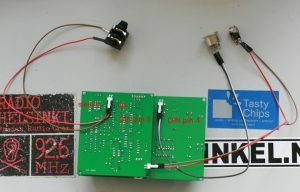 Completed analog board. If you did it right, it should look more or less like this. First to solder the wires to the connectors. Easiest is to use dupont female-to-male wires for this. Solder the male side to the connectors and fit the female side onto the headers. See the picture below for instructions on which pin is which. The assembled electronics and the panel-mount connectors. 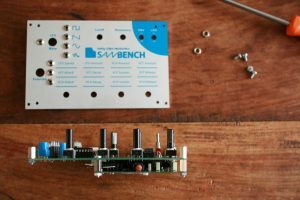 Everything is soldered, and the Sawbench should basically work. A quick electrical test is good idea. 2) Hook up MIDI in (make sure the right MIDI channel is used in your setup, the default is 1). 3) Hook up power. Look at the manual: this should be 9-12V DC, center positive and at least 1A. If rated current is too low the sawbench will be half functional and will give off a nasty mains hum. 4) A short start-up sequence should be visible. 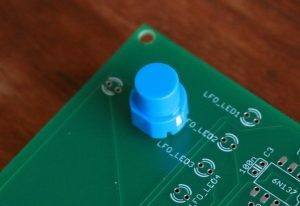 The LEDs should start scrolling faster and faster and finally the LFO LED should start pulsing. 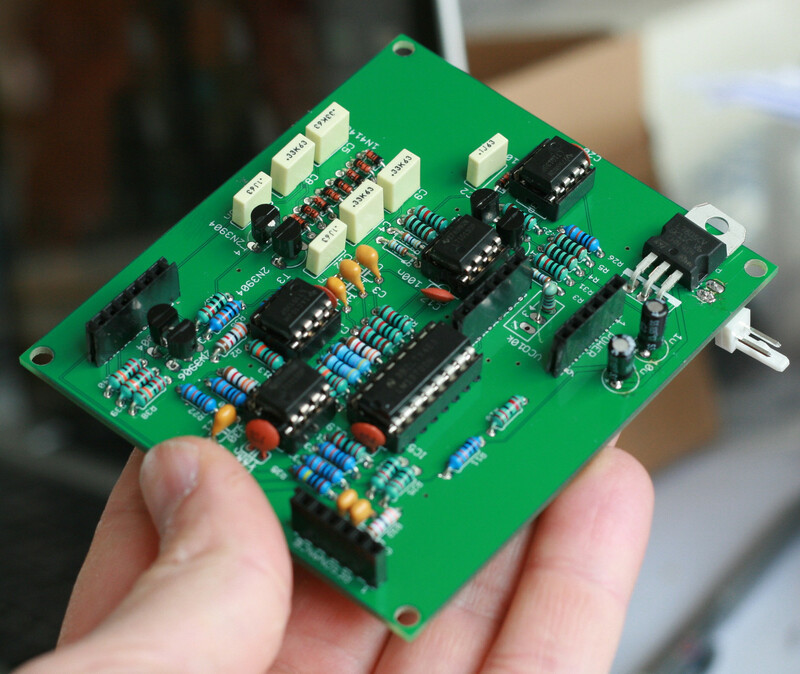 This means there is power and the microcontroller is functional. 5) Test the blue buttons: pressing them should scroll through the LEDs. 6) Try playing a note. Cutoff should be open, VCA Attack and Decay should be 0, Sustain should be completely open. If you hear the note playing: congratulations! 7) Try the toggles and pots to test if the control components are correctly soldered. 1. Is 5V present on the atmels and 595’s supply pins? 2. Is the startup sequence: blinking leds, showing? 3. Is there a signal on the 6n137 pin 6 when MIDI data is playing? 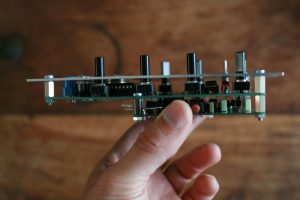 – Reversed components. 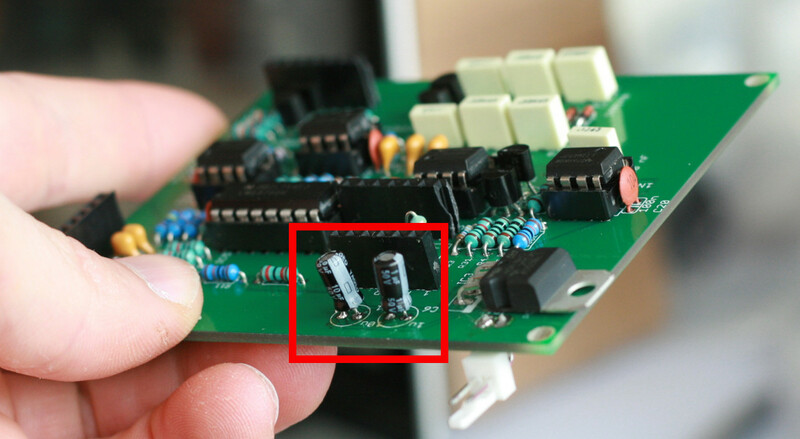 When the Atmel is reversed the LEDs won’t light up! Same goes for reversal of the 595. 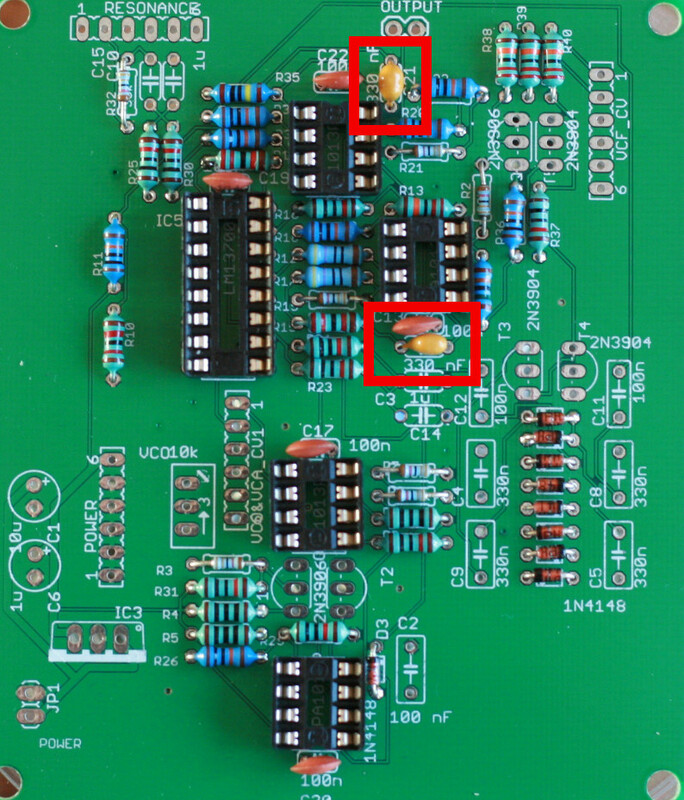 A reversed opamp is a dead opamp. – Reversed MIDI or power wires..
– Bad contacts. Be sure to double check all contacts. For the digital board it’s simple. A bad contact on the microcontroller means a completely non-working synth. For the analog board it’s more complicated. For instance, a bad contact in the VCF may increase the cutoff frequency. 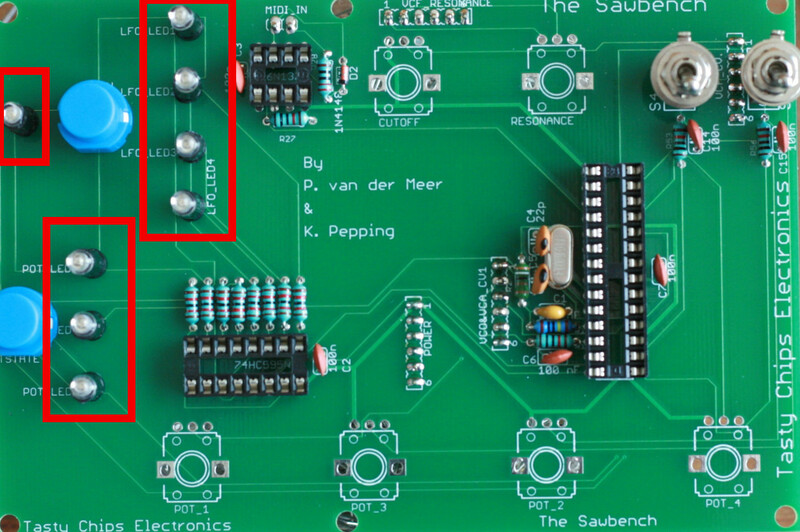 It won’t hurt to resolder all of the points on the analog board. Assuming the connectors have now been wired (see above).. 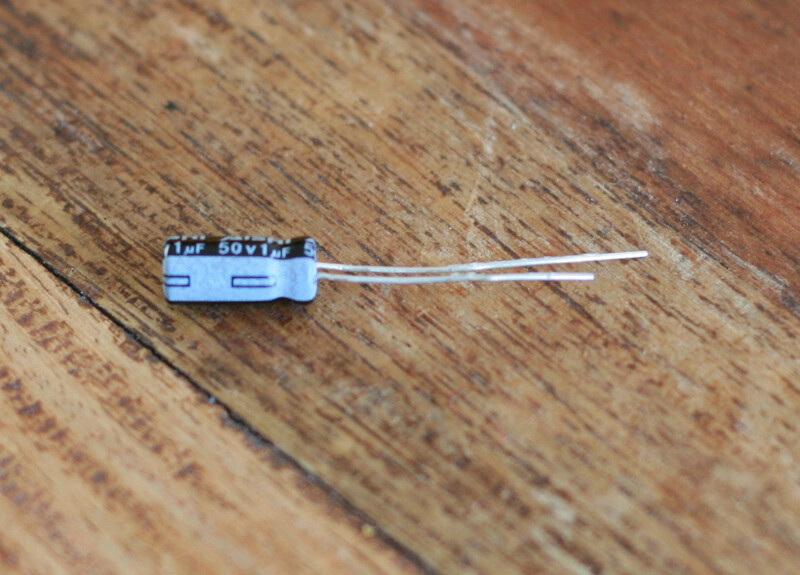 The MIDI connector is secured with two screws. The screws can be additionally fastened with M3 nuts. The other connectors are fastened screwing on their own nuts. 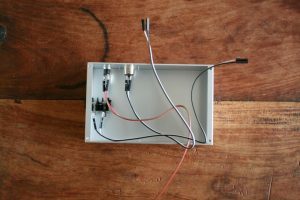 The casing with the connectors in place. The nickel LED housings should be inserted into the frontplate like shown in the photo below. They should be fastened with the supplied nuts. The rings may also be used for a more robust assembly (although our tests revealed that their added value is marginal). The front plate with the LED housings in place. 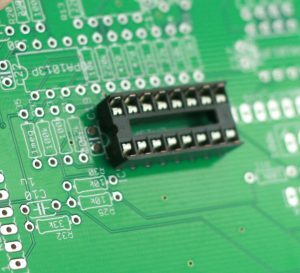 Use the spacers, screws, and nuts to make sure the analog board will never let go. 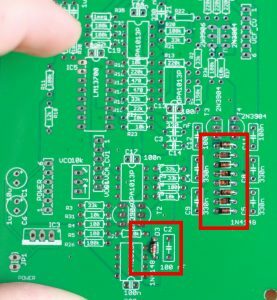 Although the headers are already sufficient the keep the PCB’s stuck toghether this measure will ensure they will stick even when treated very roughly. The electric sandwich fastened with spacers, nuts and screws. For this to work the toggle switches should be cleaned: all the nuts and washers should be gone. And also it goes without saying (well, we’re saying it anyway), that the pot knobs should be removed also. The frontplate should be slid over all the control elements (toggles, pots, button, LEDs) and then be pushed down gently. Toggles and pots should be easy. 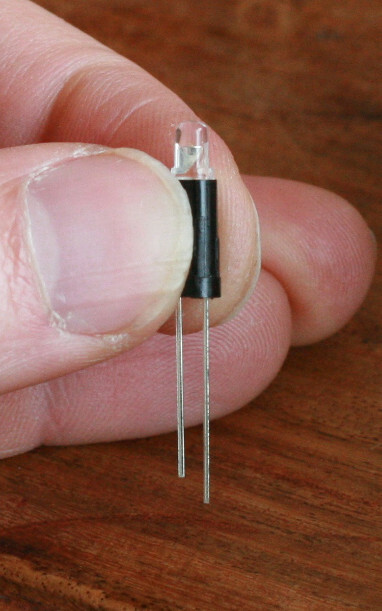 LED’s can be tricky because they can be somewhat non-perpendicular to the PCB. The same goes for the buttons. When you push down, you can align the buttons and leds with a screwdriver. Often that works miracles. Now push down a bit more until the frontplate touches the spacers. The LEDs should also start bulging through the front plate. When that’s done, screw in the inner screws. This reliably fastens the front plate to the electronics. The nuts can now be screwed onto the toggle switches. The front plate fastened to the sandwich using the four “inner” screws. The final step: just insert the whole frontplate+electronics assembly into the casing. Make sure you test once more. Power on and play some notes. Then screw in the outer screws, and presto! The Sawbench is complete! 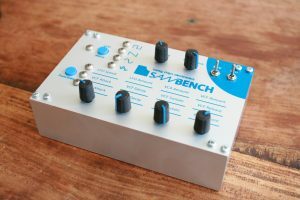 The Sawbench hardware and software is now (Nov 2018) completely open source and in the public domain. You may hack and experiment with the source code and schematics as you see fit. The firmware can be hacked and uploaded to a standard Arduino UNO (Atmega328-based). 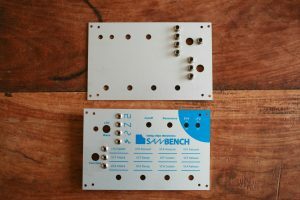 The Atmega from the UNO can then be placed in the Sawbench. There will be firmware updates from us, certainly when bugs need fixing (for instance, the MIDI overflow bug which was fixed in v1.1). 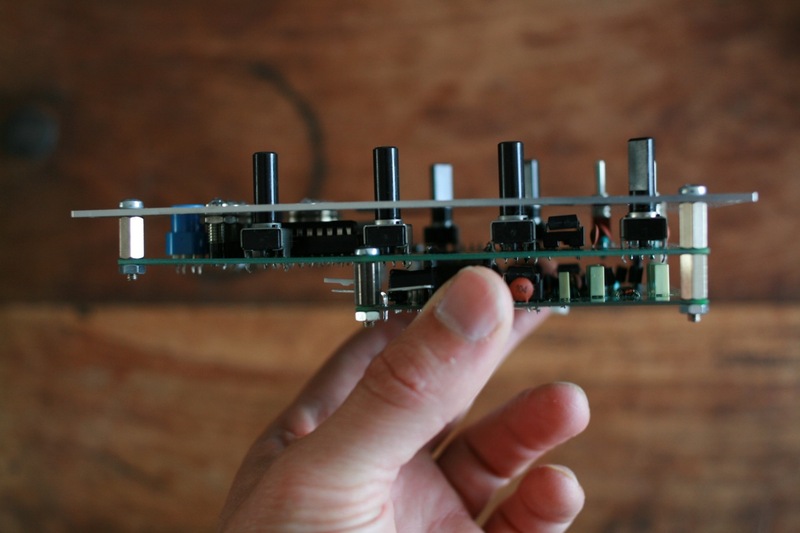 And, you can also hack it yourself, for instance to set a different MIDI channel. The firmware on github also contains a readme on how to update the Atmega328. If your Sawbench is not working and you are out of ideas what could be the problem, you can try the forum or contact us by mail: tastychipselectronics@gmail.com. The drills file is useful if you want to DIY your own casing.